Recorded at EMI Studios, London. Human beings have been having parties ever since there have been human beings. One of the several good things about the human race is that it is basically fun-loving, hospitable and gregarious, and only too willing to take advantage of any pretext or excuse for a celebration in the form of a party. One can only conjecture about parties that took place in the earliest days of the human race. Unless it was a hot summer, they probably took place in caves with everyone wearing their best furs and drinking whatever passed then for party punch. The music would be provided by someone beating a drum and maybe someone plucking a primitive stringed instrument, and undoubtedly everybody would be singing along together as the party punch mellowed them and eased their inhibitions. Everybody would probably have had to stay the night as well or else run the risk of falling victims to roaming dinosaurs, brontosauruses and pterodactyls on the way back to their own caves. As time progressed, parties became more elaborate and indulgent. The Romans particularly knew how to spoil themselves with feasts lasting for days during which everyone ate and drunk themselves to a standstill (or fall-down), felt better and then started all over again. Indeed, some people believe that the characteristic Roman posture of reclining sideways on a couch was a practical measure to ensure one didn't have far to fall. There were minstrels and dancing girls to help the party spirit, and those dancing girls would probably have been astonished and even hurt if dancing was all that was required of them. And so to the present day, where parties usually are not the ribald, roistering excesses they were during Roman and medieval times. The human race has not lost the capacity to enjoy itself at parties, however, given convivial company and the right atmosphere. 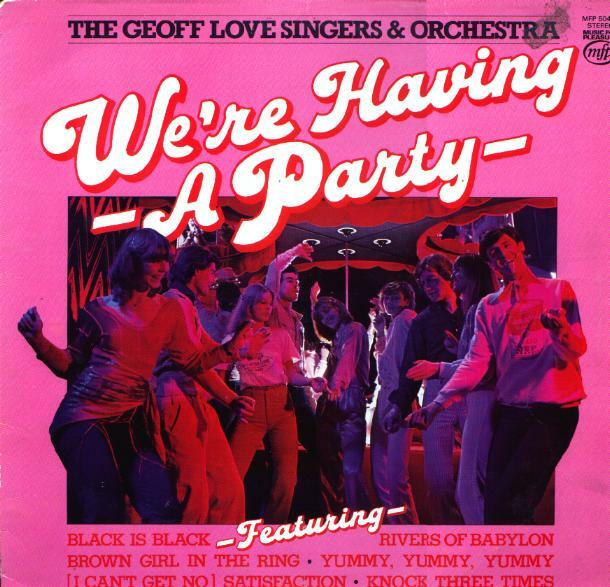 The latter will be assisted enormously by this party album from the Geoff Love Singers, containing the right mixture of party songs presented in such a way that your fellow guests will be unable to resist joining in. Whether your friends are coming over to your place or you're going to theirs, this is the record to get the party going with a swing. And no one has anything to fear from dinosaurs, brontosauruses or pterodactyls on the way home afterwards — unless the punch is far too strong.